A Bomb is a Final Fantasy enemy that looks like a large flame with an angry expression. 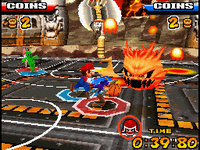 In Mario Hoops 3-on-3, Bombs appear in the Bowser's Castle and Rainbow Road courts, where they jump out of the lava along with several Lava Bubbles. The Bomb will then float over the court and will explode if the player touches the Bomb with the stylus. All players affected by the explosion will be burned and start running around, as if they had touched a Lava Bubble. If a character touches a Bomb, they will be knocked back and lose the ball. Bombs appear in many colors. This page was last edited on May 28, 2018, at 08:52.